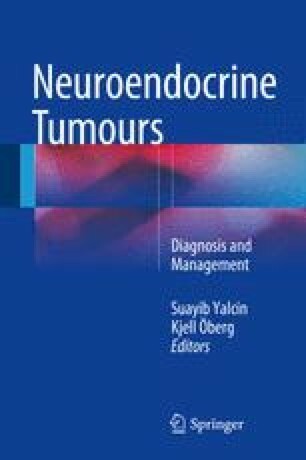 Neuroendocrine lung tumors are divided into typical carcinoids, atypical carcinoids, large-cell neuroendocrine carcinomas (LCNEC), and small-cell lung carcinomas (SCLC), depending on the appearance in light microscopy. Typical and atypical carcinoids are slow-growing tumors, yet with malignant potential, while LCNEC and SCLC are highly malignant tumors with early development of metastases. Respiratory symptoms, such as cough, hemoptysis, and recurrent pneumonias, are common on presentation in patients with carcinoids, but many of these cases are asymptomatic and detected on routine chest X-ray or CT scan. Patients with LCNEC and SCLC may present with respiratory or general symptoms, including weight loss. Ectopic hormone production leading to endocrine symptoms, such as Cushing’s syndrome, is uncommon in carcinoid patients but more common in SCLC. Diagnosis is made by chest X-ray, CT scan, positron emission tomography (PET), biopsy for histopathology, and, in patients with endocrine symptoms, hormone measurements. The main treatment of patients with carcinoids is surgery, leading to cure in most cases. Metastatic disease can be treated with chemotherapy, peptide receptor radionuclide therapy (PRRT), newer targeted therapies such as everolimus, or biotherapy including somatostatin analogues. Patients with LCNEC are treated with surgery (if possible) and platinum + etoposide. First-line therapy for patients with SCLC is platinum-based chemotherapy, in patients with limited disease combined with thoracic radiotherapy. Prophylactic cranial irradiation is added in responding cases. The prognosis for patients with typical carcinoids is excellent; the vast majority are cured by surgery. Atypical carcinoids are more malignant, with higher risk for distant metastases. Patients with LCNEC and SCLC have a poor prognosis, with short expected survival.